The President of Nigeria's Senate, David Mark, recently advocated clamping down on social media in the country. Many netizens perceived his comments as a declaration of battle on the Nigerian web. Mark had last Thursday, while declaring open a two-day retreat for Senate Press corps in Umuahia, Abia State, reportedly said the check became necessary as people used the media to demean their leaders. He added that there was no opportunity for retraction of information in such media. We need to change our attitude on how we report things about our country and we should emulate the foreign reporters who never report negative things about their countries. Netizens: the Nigerian politician's nightmare? Mr Mark is justified, because, you see, there’s so much money can buy; and there’s even much more plenty of money can buy. The more money you make without working, the more you want to spend without sweat. He pays himself N600 million from Nigeria’s treasury in one year. That isn’t heavenly or biblical year. It is earthly year as we know it; twelve calendar months, the one within which Barack Obama, the United States president, earns N60 million. What Mr. Mark pays himself in one year is the salary of a US president for ten (yes, ten!) good years. What Nigeria’s number three citizen takes home, legally, in one year, is what the number one citizen of the world’s biggest economy, and only remaining super-power, earns in ten years… You see why he has to checkmate social media? You can’t have access to such amounts of free money without being sensitive to any avenue through which opposition rears its envious head… So for taking home N600 million for doing nothing, why will David Mark not feel threatened by social media? Nigerian netizens have jumped gatekeepers! It was easy for him to buy up the entire mainstream media peopled by brown-envelope-seeking journalists and editors in a hurry to join the resource-grabbing frenzy of those who rule Nigeria. His Ghana-must-go bags were handy for willing media people who had no regards for the sacred role the society, and their jobs, had thrust upon them. Today, Mark can’t control what gets into the new media. He can’t control the number of people who read just a tweet, or Facebook post or blog post, detailing how much David Mark grabs monthly from the purse of a nation in pathetic poverty. He can’t control who reads this piece or who doesn’t. He can’t pull down this website or the other ones linked to it through which this piece will be read by thousands or millions of Nigerians. And this is why he is troubled. As Babangida’s minister of communication, he told whoever cared to listen to perish the thoughts of making telephone available to Nigerians. He stated, clearly, that telephone wasn’t for the poor. It was for the rich, eaters of hundreds of millions of naira from Nigeria’s commonwealth. Today, the senator watches even roadside mechanics clutching their phones, reading the internet and seeing how much of a curse to them this government has become. If you were Mark, you’d be troubled too. David Mark had an exciting knowledge filled experience as a young telecommunications engineer in the Army and gradually rising from the position of a Junior officer to the position of a Senior officer… After He graduated from Nigeria's apex military training school, the Command and Staff College (CSC) in Jaji, Kaduna, he was posted to the Corps of signals as Commandant… During the David Mark's political appointment in the military he was probably the youngest member of the Armed Forces Ruling Council (AFRC), the highest decision making body in the country then. Even the discerning critiques of the militray politics knew that Mark was a very influential member of the AFRC. It is therefore not awkward that with this background, Nigeria's Senate President will certainly have no love lost for social media. The reactions by Nigerian netizens are as snatching as his remarks. @WilDeji: You hear people like David Mark talking about ‘social media’, don't you understand that there's been a recent meeting? @Doug_E_Styl: David Mark needs to shut Richard Branson up too, he's giving the Country a bad name…no? @ged: We're taking comedians serious. This is not military era. If David Bonaventure Mark cannot stand the heat, he can as well quit the kitchen. @PUREHAIRE: David Mark sha…his mumu talk sometimes sef. When 2015 nears, they'll rush to the social media to solicit for votes but now, we r insulting. @ged: …or maybe David Bonaventure Mark was envious of Goodluck Ebelemi Jonathan, wanted his own share of the social media attention. Just maybe. @Nedu64: Apparently, David Mark underestimated this community.I will watch the bashing! The witch cried at night and the baby died in the morning? Chinedu Ekweke's (@ekekeee) blog post went viral on the Nigerian's blogosphere. 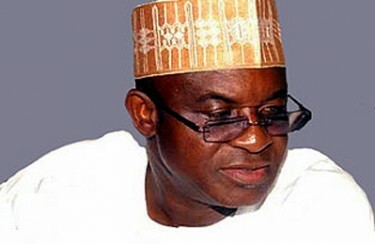 It was a beautiful response to David Mark's comments and enjoyed many re-tweets. But soon after, complains of inability to access his blog flourished on Twitter. @ekekeee: We are sorry at the turn of events this morning. EkekeeeDOTcom is unfortunately not coming up. Our technical team is working to restore it. @PUREHAIRE: @TKSlam @egbas @ekekeee A case of the Witch cried at night & the baby died in the morning! David Mark's hooligans are working. @thenaijaseer: Is dis d best GEJ, David Mark, and Doyin Okupe can do? Bring their Boko Haraism online? @egbas: The hackers will not win, that's for sure. This will strengthen the @ekekeee team even more. EkekeeeDOTcom hasn't even scratched d surface.